A series of interactive digital billboards at London’s Euston Railway Station is raising awareness about how a person can help put a stop to domestic violence. The billboard for the National Centre for Domestic Violence shows an angry man verbally abusing and acting in a threatening manner towards a frightened woman. After a few seconds a message appears urging viewers to ‘Use Your Phone to Stop This Now – Drag Him Away at ncdv.org/stop. 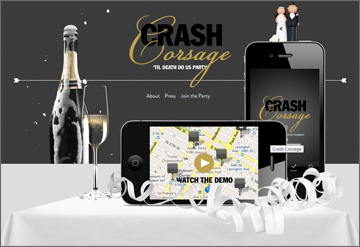 At the mobile site, the viewer can swipe their finger on the screen to pull the man away from the woman. The action is repeated at the train station as the man is pulled away across five adjacent digital screens revealing the message ‘An Injunction Will Put Distance Between a Victim and Their Abuser’. The ‘Drag Him Away’ campaign was created by JWT London, and was produced by Grand Visual. The much maligned QR code gets a boost of creativity thanks to an initiative by South Korea chain store Emart. The stores were suffering low sales over the lunchtime hour. 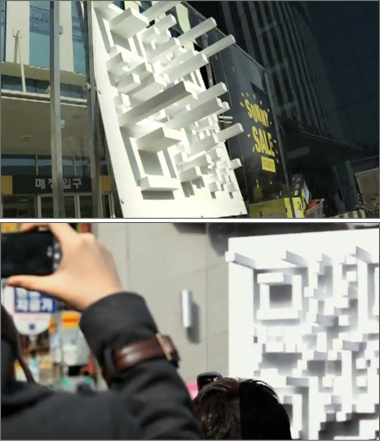 To solve this issue they created a three dimensional display that revealed a shadow-based QR code only during the hour of 12 to 1pm when the sun hit at just the right angle. 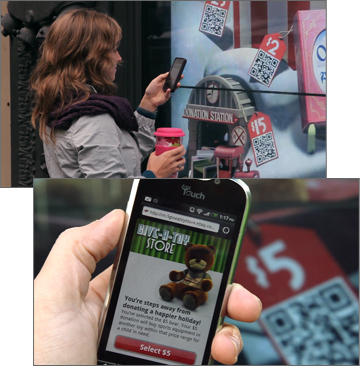 When scanned the users were directed to the eMart ‘Sunny Sales’ mobile site where they could take advantage of special offers including a $12 off coupon, redeemable in-store or on the mobile site. The site orders would be delivered the next day to the buyer’s home. The campaign proved to so successful that the program was expanded from 13 to 36 locations. 12,000 coupons were issued, there was a 58% increase in eMart membership, and most importantly a 25% increase in sales of eMart mall during lunch hours. The agency behind Emart’s ‘Sunny Sales’ shadow QR-code is Cheil Worldwide, who last year had produced the Tesco subway virtual store. 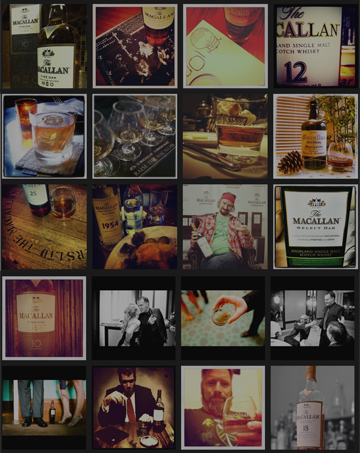 The Macallan, a premium Scotch whisky distiller has launched a photo competition using the popular online photo sharing site Instagram. Entrants are asked to take a photo of themselves with The Macallan, or one that represents their love for the whisky brand, the upload it to Instagram account using the hashtag #meandthemacallan. The top five pics will win a special prize from the distiller as well as being featured on The Macallan’s Twitter and Facebook pages. You can review the entries here. Instagram is available as a free download in the iPhone Apps store. An Android version is rumoured to be released soon. If there’s one thing those of us who live in northern countries can relate to it’s the struggle of waking up in the darkness of winter morning. I’m an admitted snooze button abuser, especially in the winter. Lufthansa released the Anywake app to make the dark mornings a bit brighter for sleepy Swedes by waking them up to the sounds of another city. Anywake works like a normal smartphone alarm clock app; you set your waking time before you go to sleep and in the morning you’re woken up to the sounds of a randomly selected city. If you can figure out which city it is within 60 seconds, you’ll win a discount on a Lufthansa flight to that destination. If you can’t solve the challenge, you’ll have to wait until the next day. But at least you’ll be wide awake and mildly frustrated, which is a great way to start the day. 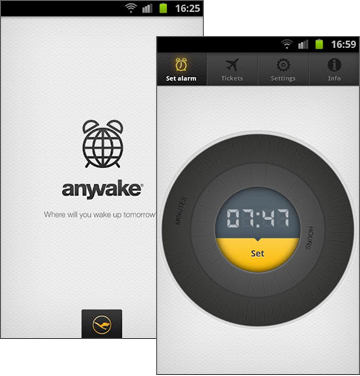 Anywake was developed by DDB STockholm and is available free in the iPhone App Store and Android Market. US outdoor clothing retailer Moosejaw is giving it’s Winter catalog readers a much more revealing look at it’s models. They’ve released the X-Ray Vision app for iPhone, iPad and Android devices allowing readers to see what interesting items their catalog models are wearing underneath their heavy winter jackets and pants. If you don’t have a print version of the Moosejaw catalog you’re still in luck, the app is also designed to work with digital versions of the catalog available at MoosejawCatalogs.com or the Moosejaw Catalogs App for the iPad. 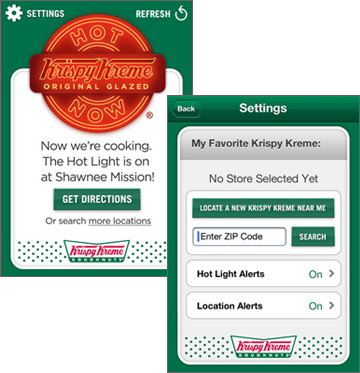 The app can also be used on signage at one of Moosejaw’s retail stores. Now, I hope someone out there has a good explanation as to why that dude on Page 40 has an octopus underneath his clothes in what appears to be saran wrap. With the holiday shopping season lurking just around the corner, Macy’s has released the ‘Believe-o-Magic’ mobile app for iPhone, iPad and Android. 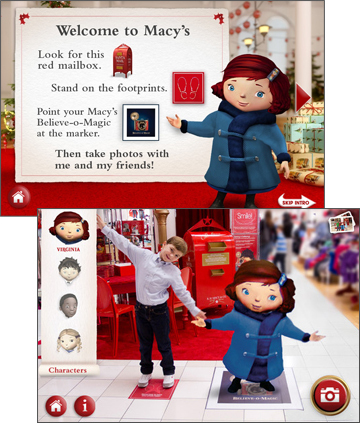 The app uses augmented reality marker technology at special ‘Believe Stations’ within Macy’s stores nationwide to bring the characters from the animated movie ‘Yes, Virginia‘ to life. The app can then be used to capture a picture of the character and your child to create a customized holiday card that can be sent to family and friends directly from the app. For those not able to visit a Macy’s store, a marker can be printed from the ‘Million Reasons to Believe’ website that provides a sneak preview of the in-store augmented reality experience. The ‘Believe-O-Magic’ app can be downloaded free for the iPhone or iPad at the iTunes app store or at the Android Market.